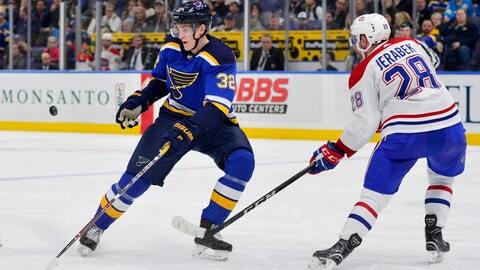 Then-Blues forward Tage Thompson faces then-Canadiens defenseman Jakub Jerabek in January. ST. LOUIS — The Blues have acquired defenseman Jakub Jerabek from the Edmonton Oilers for a conditional 2020 sixth-round pick. The 27-year-old Jerabek won the Stanley Cup with the Capitals last season after playing in 11 regular-season and two playoff games for Washington. He was not expected to make the Oilers’ roster. In 36 games with the Montreal Canadiens and Capitals last year as a rookie, the Czech native has two goals and six assists. He could fit on St. Louis’ blue line for its Thursday season opener against Winnipeg with Robert Bortuzzo suspended for a hit to the head of Washington’s Michal Kempny.